The radiologist uses ultrasound to locate the area for biopsy and to direct the needle used in collecting breast tissue samples. How is a Breast Biopsy done? The stereotactic table is specially designed so that you can lie face-down with one breast positioned through a hole in the table. Two digital x-ray images are taken from different angles, allowing the radiologist to precisely localize the area to biopsied. Once the area has been located, the radiologist numbs the area with a local anesthetic, then uses computer guidance for precise needle placement and collection of small tissue samples. Both methods are as accurate as a surgical biopsy and are performed on an outpatient basis, taking less than 40 minutes to perform and requiring no stitches. Furthermore, the patient can resume normal, non-strenuous activities immediately after the procedure is done. The samples are sent to the pathology lab for analysis. Results are usually available within 48 hours. 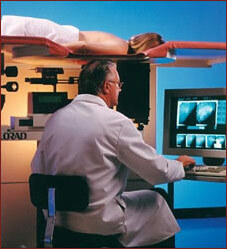 Our breast radiologists were some of the first to perform this procedure in the country. We can perform a standard needle biopsy in the MRI suite if a lesion is detected only on a Breast MRI exam, and this can be performed in under an hour. Wire Localization. Used to prepare for an open biopsy, a wire is positioned under ultrasound or x-ray guidance, in the suspicious region of the breast. In this way, the area to be removed during the surgical biopsy is identified. If you take aspirin or blood thinners, you will be asked to discontinue using these 5 to 7 days prior to the procedure. This interruption in maintenance medication should be approved by your physician. Regular medications should be taken as prescribed. A comfortable two-piece garment should be worn, as well as your bra. You should avoid using talcum powder or deodorant on the day of your biopsy.